Corinth Pipeworks, Thisvi, Greece, Coating/Lining - Corinth Pipeworks S.A. The first layer is a fusion bonded epoxy primer. 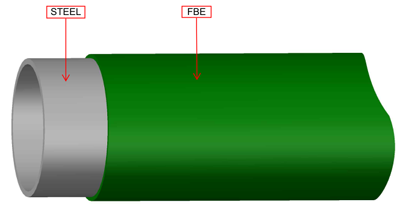 This provides a thin continuous layer which is bonded with the metal surface of the pipe. The excellent chemical resistance properties of the Epoxy layer provide long term corrosion protection. The good bonding to the metal guarantees excellent resistance to Cathodic Disbondment. The second layer is a copolymer adhesive. The reactive groups in this compound bond with the partially polymerized primer, while the carbon chain, which forms the molecular backbone of the copolymer, has affinity with the polyolefin topcoat. The third layer is a polyolefin topcoat. Applied while the adhesive is still tacky. Strong mechanical and Van Der Waals’ bonding takes place between the carbon chains of this layer and the adhesive. The Polyolefin Topcoat gives the pipe excellent Mechanical and Handling properties as well as Corrosion Resistance. Most commonly used High Density Polyethylene. 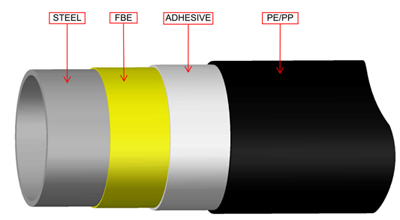 Polypropylene is used when the pipe operate at elevated temperature. Polyethylene or Polypropylene powder can be applied over the topcoat for anti-slip purposes. The name fusion bonded epoxy is due to resin cross-linking and the application method, which is different from a conventional paint. The resin and hardener components in the dry powder FBE stock remain unreacted at normal storage conditions. At typical coating application temperatures, usually in the range of 180 to 250 °C (356 to 482 °F), the contents of the powder melt and transform to a liquid form. The liquid FBE film wets and flows onto the steel surface on which it is applied, and soon becomes a solid coating by chemical cross-linking, assisted by heat. This process is known as “fusion bonding”. A second thicker layer of special fusion bonded epoxy can be applied over the first layer during the melting phase for the enhancement of the mechanical properties of the coating system. This second layer is often called Abrasion Resistance Overlay (ARO). 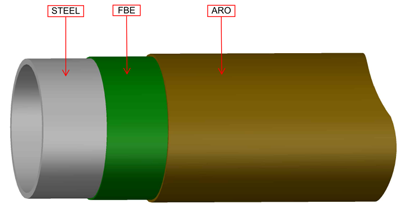 Two component liquid epoxy is applied on the internal pipe surface using airless spray technique. The lining provides a very smooth internal pipe surface and frictionless flow of fluids. At higher thickness provides excellent corrosion protection. It can be applied in a wide range of pipelines including pipelines for potable water.